This powerful, high output LED under cabinet spot light is the perfect complement to our LED under cabinet light bars. 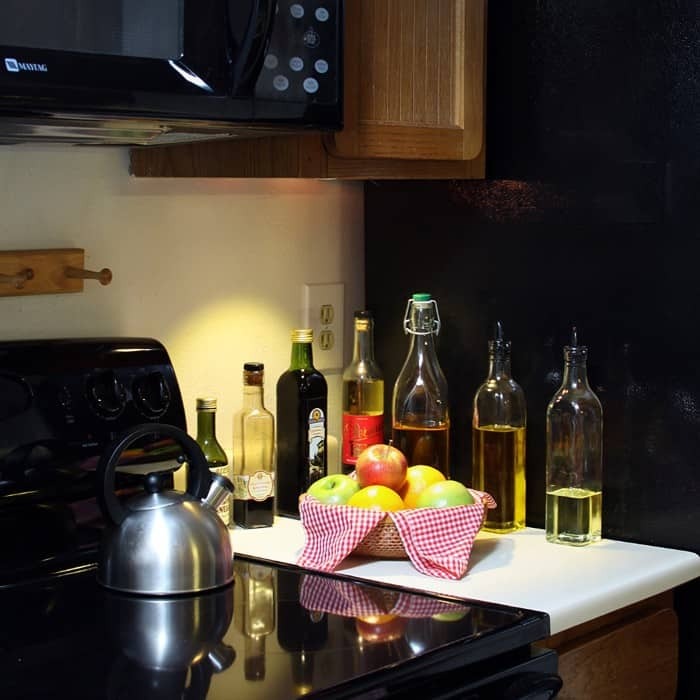 Use for task lighting over cutting or food prep areas. It can also be used to light a workbench area. It produces an amazing amount of warm white light while using only 2.6 Watts of power. This low profile (0.33” tall) light puts out an amazing amount of warm white light (over 250 lumens). 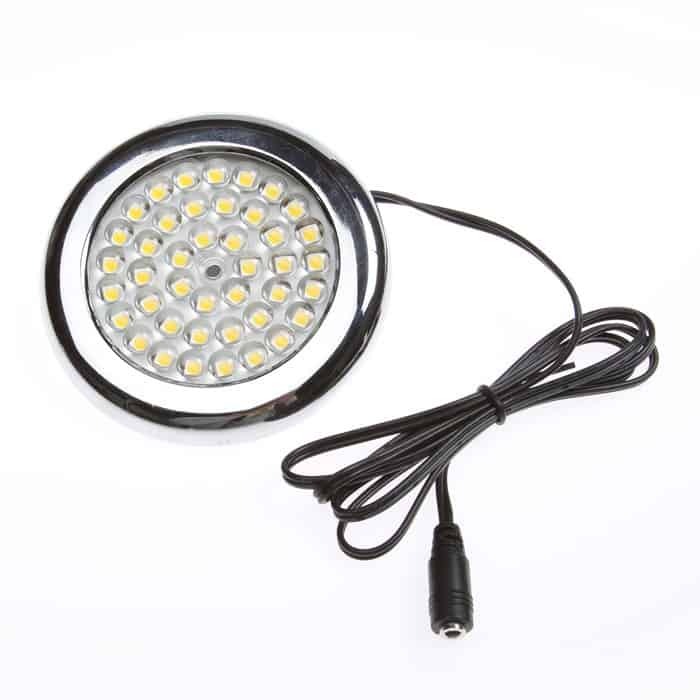 It has 42 individual LEDs and is extremely energy efficient, using only 2.6 watts of power. The light is highly reliable, ultra easy to install, and is backed by our 5 year DEKOR™ warranty. Installation is simple using the provided single mounting screw. In seconds it’s up and ready to use. See the Installation tab for a helpful diagram. Insufficient task lighting for cutting food is a common kitchen design mistake. If you are performing any task that requires fine motor skills, such as chopping or cutting vegetables, you need more light. This is our task lighting solution for cutting or food prep areas, where ever you need really bright light. We see this LED under cabinet spotlight as an absolutely perfect complement to our original LED Under Cabinet Lights and part of a well thought out kitchen lighting design. It is low profile so it will not be visible beneath your cabinets and can be combined in sequence to create a custom “zoned” countertop. With only a single connector this light will need to be at the end of a circuit or used with our under cabinet cable splitter when used with more of our lights. We recommend you consider getting our remote-controlled EZDimmer or our new Under Cabinet Low Profile Dimmer for use with this very bright light. Whether you are looking to light a workbench area, under a corner cabinet, or even a closet this light is absolutely ideal. Because of the low profile (0.33” tall), you can even put them on the top of your cabinets and illuminate that dark corner that has always bothered you. We recommend you also purchase a remote-controlled EZDimmer or our new Under Cabinet Low Profile Dimmer for customizing the light output for this very bright light. The l.e.d. lights from Dekor are great! Sleek design and bright. I also really appreciate the excellent service and attention from the Dekor staff. I’ve been using them for several years now and will definitely continue. These lights worked perfectly in my customers remodeled kitchen. She gave me a great big hug and said they were exactly what she wanted and what I had described as in selling the job to her and her husband. With only a single connector this light will need to be at the end of a circuit or used with our under cabinet cable splitter when used with more of our lights.